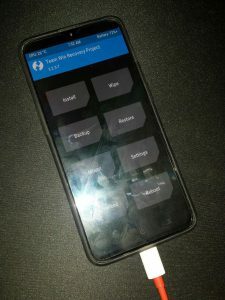 Team Win Recovery Project, in short TWRP, is a must have element for every Android modder. If you are planning to unshackle your device from the bloated/early-abandoned stock OS or want to root your phone – TWRP is here for rescue. But there is a catch! There is no universal TWRP image. One must build device-specific variant of it and share with the rest of the community. Sometimes a new software update may break important stuffs like encryption support in existing TWRP. Thus continuous maintenance is absolutely necessary to ensure compatibility. The UI of TWRP needs a facelift after the introduction of notched display. TWRP’s interface is XML driven and remarkably easy to theme. Some devs are trying to create a new theme to hide the notch. Another group is planning to introduce device specific adjustments in the UI to achieve the same. Mi Mix 2s (codename: polaris) and Mi 8 (codename: dipper) are the newest members in the roster of officially supported devices by TWRP. Both of them share a common kernel codebase which is helpful for the maintainers to work together and squash the bugs. Mauronofrio Matarrese AKA mauronofrio is the official TWRP maintainer of both OnePlus 6T and Mi 8. According to him, a new portrait theme for handling the notch via theme would be better choice than tinkering with the UI. This theme will create a black bar on the top of the screen so the notch will be hidden. Ethan Yonker AKA Dees_Troy, the founder and lead developer of TWRP is somewhat against the introduction of another theme. I think we’re going to have to agree to disagree on this theme as I don’t see a need for a separate notch theme. The build flag provides an acceptable workaround though I personally never even thought that using the build flag was a necessity. He thinks that the notches are the intermediate results of display tech evolution. The rise of punchholes and in-display sensors will eventually eliminate the notched displays. IMHO, notches are already on their way out. 2018 was the year of the notch and 2019 is starting to look like the year of the punch hole. In another year or 2, notches will probably be a thing of the past for most devices. Another point of concern that I have for this theme is the fact that different notches are different heights and sizes and I don’t see anywhere that this theme addresses that issue (consider how tall the notch is on the Pixel 3 XL). The build flag allows the device maintainer to adjust the height for each device. FYI, the TWRP support threads for these two Xiaomi phones can be found here (Mi Mix 2S) and here (Mi 8). Most of the standard features are reported be working, including data decryption. Regardless of the debate, mauronofrio shipped the theme with the release of TWRP for Mi 8, noting “… this is the best solution for all devices with notch”. The recovery image of Mi 8 **may** boot on other variants like Mi 8 Pro (codename: equuleus) or Mi 8 Explorer Edition (codename: ursa), but it is not recommended to use them further.